Amanda RAdke | Mitchell, S.D. The Totton family supports the troops in many ways, but while they're telling military members they care, they're also telling them how proud they are to produce beef. This was the message on the t-shirt the Totton family team wore at the Black Hills Veterans March and Marathon. Charles and Tanya Totton of Totton Angus near Chamberlain, S.D., are proud to support the troops. With several family members having served in the military, both past and present, their hearts are with the men and women who are making sacrifices to protect America's freedoms. They recently participated in the 11th Annual Black Hills Veterans March and Marathon (BHVM) on the Mickelson Trail in the Black Hills of South Dakota. The march was hosted by the South Dakota National Guard Enlisted Association and raises money to support organizations like the VA that help veterans across the country. One of the organizers of the event was Charles' and Tanya's daughter, Courtney (Totton) Tyrrell, who encouraged her parents to not only be a sponsor of the march, but to also participate. "My grandpa was a veteran, and he was a big reason why I got into the military myself," said Tyrrell. "It's amazing how much the VA helped him in the last couple of years of his life, so it's important to me to be a part of something that raises money to support organizations that help our veterans. The race raised $6,000 for the veterans." "My job is to raise money for the event," she added. "My parents have been proud sponsors the last couple of years, but this year I really wanted them to participate in the race itself. It was a fun challenge for them." After some persuasion from Tyrrell, the Totton family put together a civilian co-ed team for the march, opting for the half marathon (13.1 miles) instead of the full 26.2 miles. Their team included Charles and Tanya, Courtney and her husband Jonathan, and friends John, Gabrielle and Rowdy Hoing, and they placed first in their division at the race, with more than 230 individuals racing in the event. ""I made an attempt to walk three miles every night in preparation for the race," said Charles with a chuckle. "It was a really positive experience overall. I have a daughter, brother and dad who are veterans, so this is a pretty easy thing to support. I think it's important for everyone to support our troops, with everything that's going on in the Middle East. We need our military men and women to serve, and they need to know we stand behind them." A true cattleman at heart, Totton didn't miss the chance to promote beef while supporting the troops. 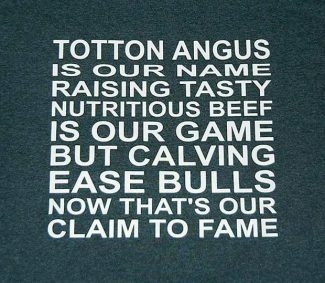 He designed Totton Angus team shirts with the slogan, "Cotton Angus is our name. Raising tasty and nutritious beef is our game. But, calving ease bulls is our claim to fame." "I came up with the slogan myself," said Charles. "We all wore the shirts while we marched. I even had a lady come up to me after the race and asked for my business card. I think she's going to buy beef from us." The Tottons are in the business of selling bulls, and Charles said that promoting beef is a great way to ensure that his cattle business survives and thrives. "If people don't want beef, there's no sense selling bulls to produce beef," he said. "All cattlemen should be promoting beef if they care about staying in business. There are so many animal and environmental activists that are loudly telling people how bad beef is; we need to be a part of the discussion and talk louder than they do." Totton often wears an "I love beef" t-shirt and has participated in beef cook-offs at the South Dakota State Fair, as well as a prime rib and brisket cook-off held each year in Chamberlain. This year, the Chamberlain event was held at the same time as the march, so he loaned his "I love beef" t-shirt to his neighbor, Dean Bisbee, who won the cook-off while Totton was busy winning at the march. "I've challenged my ranching friends to participate in the race next year," said Totton. "A little rivalry will help support a great cause." "This year's event was really positive," added Tanya. "There were different stations every 4-5 miles with signs telling you how far you had left to go. They served chislic during the race. Next year, we're going to get them to pass out beef jerky." This isn't the first time the Tottons have supported the troops while also promoting beef. When the South Dakota Army National Guard's 200th Engineer Company was deployed in 2011, Tanya dedicated time to the 200th Camo Quilt Project, which included a group of local women who put together 200 quilts and raised $5,200 to support the members of the unit. Many of the members of the 200th were friends and neighbors, as the unit was based out of Chamberlain, Mobridge and Pierre. The same group then went on to partner with Operation Military Kid, and they put together Hero Packs, which included age-appropriate items like books and cameras, for area children whose military parents had been deployed. Charles decided he wanted to support the troops, as well, so he worked with the Camo Quilt Project to raise enough money to process a steer and make jerky, which he organized to send overseas to the 200th Engineer Company while the unit was stationed in Afghanistan. "When I started calling and asking for donations, I was surprised by how willing my neighbors were to donate to the cause," said Charles. "It only took five or six calls to raise the money needed to process the beef." Area ranchers donated 400 lbs. of beef, which resulted in 220 lbs. of jerky that was sent to the guard members. Chamberlain Locker gave a discount on the processing, and Totton Angus, Chamberlain Livestock Auction, Glaus Angus, Hoing Hereford, Peterson's L-7 Bar Limousin, Pharo Cattle Company, Professional Alliance, Inc., and R and R cattle Company donated the beef and helped pay for the processing. "This was our way to promote beef and support the troops," said Charles. "Everyone who was involved was really excited to be a part of this." The ranchers quietly donated to the troops then, but they hope to do it again in the future and make a bigger splash this time. 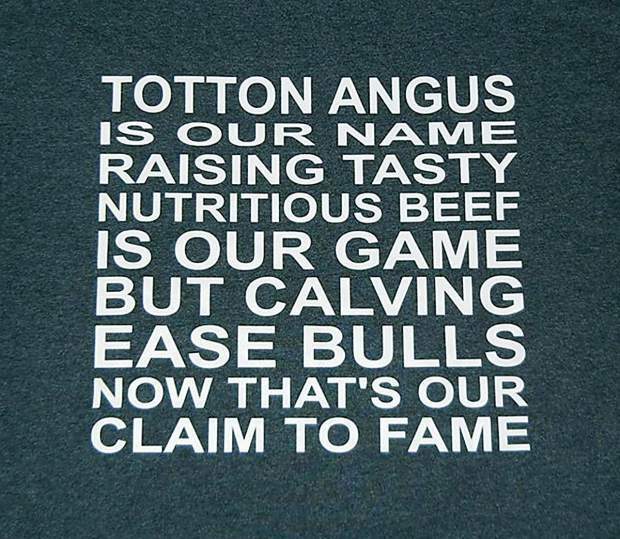 It's Totton's hope that other ranchers will follow suit and send beef overseas to the troops. "It's really a win-win for ranchers to promote beef and support the troops," said Totton. "Without their sacrifice to serve our country, we wouldn't have the freedoms to raise cattle and produce beef here in the U.S."